If I could send fragrance along with a blog post, this could be a one-sentence missive. All it would need to say is common sweetshrub (Calycanthus floridus): Smell it, love it, plant it. Eastern white pine (Pinus strobus) won’t ever make the short list of plants grown for fall color, but this native species is pretty this time of year nonetheless. The two- and three-year-old needles are now turning yellow and dropping, so don’t worry if your trees have lots of yellow needles. This feature is widely ignored in descriptions of the species, which simply list the plants as evergreen, but the patterns the yellow and green needles create really are quite pretty. So, as long as the needles on the tips of the branches on your white pines are still green, they are healthy and right on schedule. 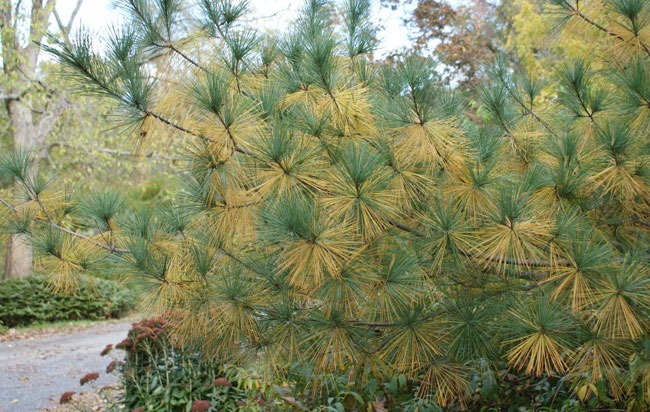 Above: Yellow and green needles on Eastern white pine make a pretty, if subtle, pattern. White pines are valuable, long-lived evergreens. This species once covered much of the northeast, and 200- to 220-foot-tall trees were common. Logging from the 18th to early 20th century claimed all but about one percent of virgin stands. Today in cultivation, mature white pines typically reach 75 to 100 feet and spread to 75 feet. Virgin stands still exist in Great Smokey National Park and a few other locations—they are worth visiting! (See “Range” at this link for a list!) Although white pines are happiest in moist, well-drained soil, they tolerate dry to average conditions, sand or heavy clay, pH that runs from 4 to 6.5, and part shade to full sun. If there’ one plant combination that could lure me to live in the deep South, it is live oaks festooned with Spanish moss and resurrection ferns. Live oak (Quercus virginiana) is a massive evergreen, hardy to Zone 8, that supports the other two plants. Blue-gray Spanish moss (Tillandsia usneoides) sways romantically all around the canopy, while leathery leaved resurrection fern (Polypodium polypodioides) clusters along the tops of the branches. I can’t think of a similar iconic combination for the Eastern Shore, at least not one that instantly tells you where you are the way live oaks and Spanish moss do. Above: A live oak with Spanish moss and resurrection ferns gracing the plantings of Brookgreen Gardens outside Myrtle Beach, South Carolina. We travel back roads as much as possible, since 95 is boring and hectic. (Did you know Route 301 goes the entire way, only joining up with 95 for a couple short sections?) I started thinking about iconic plants as I watched spring roll in as we drove south. 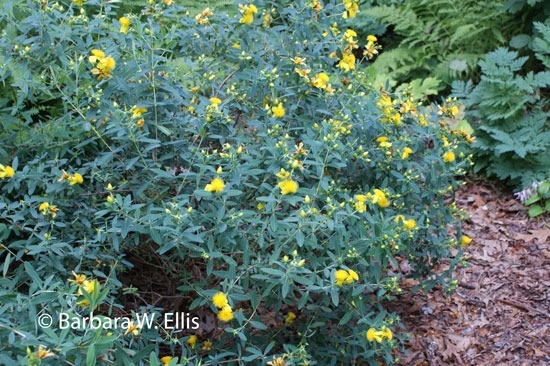 One plant that seemed to signal spring is Carolina jasmine (Gelsemium sempervirens), whose yellow, trumpet-shaped blooms were much in evidence by the time we reached the Carolinas. 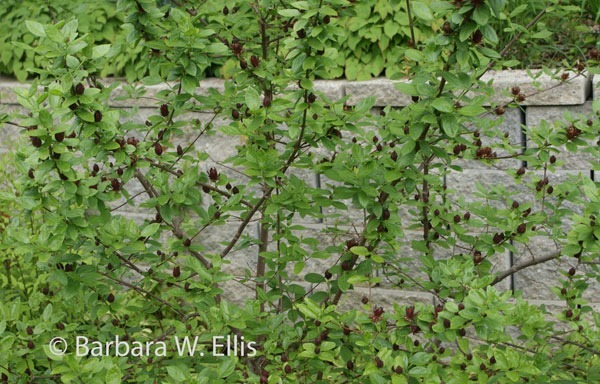 A native, evergreen to semievergreen vine that reaches about 20 feet, it grew along fences and climbed up through trees and shrubs lining the roads. It’s a lovely plant, hardy in Zones 7 to 9, that should be grown more often. I added improved cultivar ‘Margarita’ to the garden here at Hackberry Point a couple years ago. I got my plant from North Creek Nursery, who report the cultivar has larger flowers than the species and is reliably hardy to Zone 6. Its clear yellow flowers appear in early summer. (See North Creek Nursery for more information and a photograph.) In a “do as I say, not as I do” move, I finally installed a permanent trellis for it last year—luckily, without major damage! Camellias were also much in evidence both on the way down and the way back, and as we rolled back onto the Eastern Shore, I noticed the first signs of spring up here as well. There were early daffodils, especially in warm, south-facing spots, along with cherry trees in full bloom. I also spotted a Cornelian cherry dogwood (Cornus mas) strutting its stuff in Chestertown yesterday. Above: American holly along with tupelo (Nyssa sylvatica) in full fall regalia. As for iconic plants and plant combinations for the Eastern Shore, marshes along the Chesapeake Bay spring to mind. As a horticulturist, though, I decided to pick a native plant that most of us can grow, and for me, that’s American holly (Ilex opaca). I’ve never lived anywhere that it grows so well. 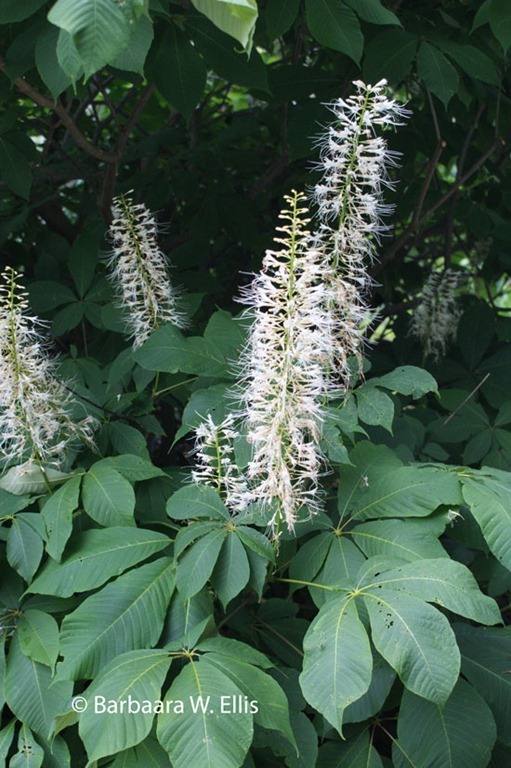 Plants thrive in our beech-maple woodland along Worton creek. I’ve seen hollies combined with all sorts of plants, and grown alone, but its native companions in the woods are my favorites. There, it grows with summersweet clethra (Clethra alnifolia), mountain laurel (Kalmia latifolia), and what I think is deerberry (Vaccinium stamineum) filling in below. In the patches of sun beneath the shrubs is a ground cover of emerald moss and partridge berry (Mitchella repens). Hollies anchor a more subtle combination than live oaks provide, but it is one that grows on you. I’ll happily claim it! Above: Mountain Laurel blooming in June, with gardening companion Casey. A travel note: If you’ve always wanted to see manatees, plan a trip to Blue Spring State Park in Orange City, Florida. My picture isn’t great, but if you look you can see one of the many manatees we spotted. (Reminder to self: Check your camera battery before you go so you can take better pictures next time!) Best time to visit is during cold weather, from late November through early April. Blue Spring is a consistent 72°F, and when the weather gets cold, manatees from the St. John’s River gather there. One person I talked to saw over 300 on a day when it was 26°F in the morning! Above: A manatee glides through the clear water of Blue Spring off the St. John’s River in Florida. 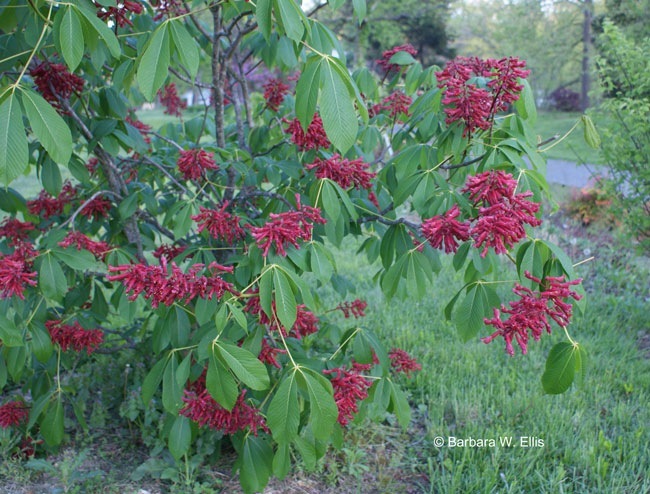 Showy red buds opening into flowers signal the season for a favorite native that is coming into bloom this week: red buckeye (Aesculus pavia). The tubular flowers are borne in panicles at the tips of the branches. (A panicle is a type of inflorescence that has a main stalk with branched side stems.) Each panicle is 4 to 8 inches long in bloom, and the individual flowers are about 1½ inches long. The flowers are showy for a couple weeks from mid spring to early summer. The flowers are very attractive to hummingbirds. I’ve been poking around for sources of the two new dwarf oakleaf hydrangeas released by the U.S. National Arboretum since I first posted about them last week. 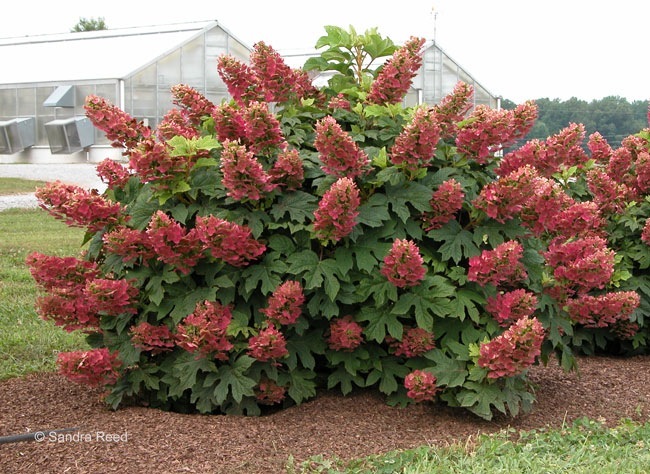 While it seems that Hydrangea quercifolia ‘Munchkin’ and ‘Ruby Slippers’ are going to be scarce on the retail level for at least another year, plants are available. Fortunately there are nurseries hard at work building up stock. Both cultivars are well worth the wait, if the descriptions and initial reports I’ve heard are any indication. 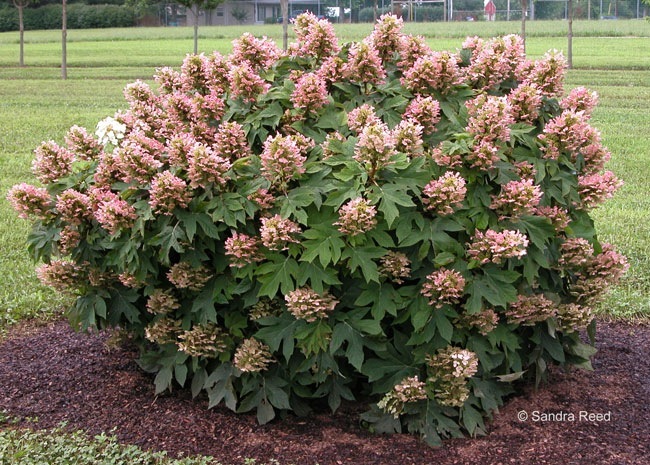 This handsome cultivar features white, 6½-long flower clusters that fade to pink as they age. The dark green foliage turns mahogany in fall. 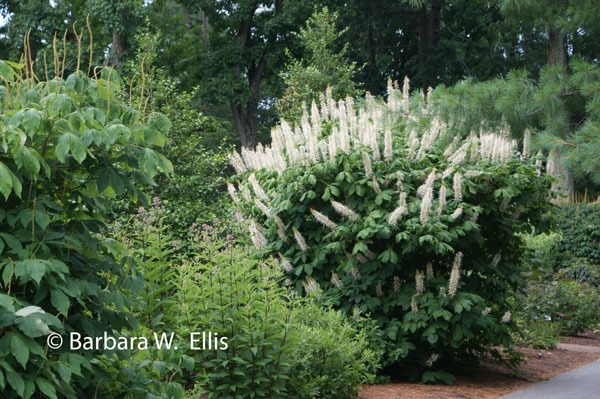 The Arboretum reports plants are 3 feet tall and spread to 4½ feet at 9 years of age. Plants can be used in mass plantings, as hedges, and in mixed borders. Since they’re wider than they are tall, I also will be using them as tall ground covers! Ron Rabideau of Rare Find Nursery has had ‘Munchkin’ for several years. He reports that it is considerably smaller than other dwarf selections, including both ‘Pee Wee’ and ‘Sikes Dwarf’. (‘Munchkin’ is a seedling of ‘Sikes Dwarf’.) Rare Find has a few plants of ‘Munchkin’ available for this spring, with more to come in the fall. Selected for its showy blooms, ‘Ruby Slippers’ produces 9-inch-long trusses that emerge white, but quickly turn pale pink and then deeper rose pink. Dark green foliage turns mahogany in fall. This cultivar is the result of a cross between showy ‘Snow Queen’ oakleaf hydrangea and dwarf ‘Pee Wee’. Plants are about 3½ feet tall and 5 feet wide at 7 years. It, too, makes a handsome addition to shrub borders, and can be used in mass plantings or as a hedge. Again, because of the spreading character of the plant, I’d consider using it as a tall ground cover for a large area. Note that while the plants in these pictures are growing in full sun, they are irrigated. Both are growing in McMinnville, Tennessee, where the Arboretum’s shrub breeding program is located. To grow them in gardens on the Eastern Shore, look for a spot in partial shade with rich, moist, well-drained soil for best results. A spot with afternoon shade is ideal. Plants located in dry soil and full sun are liable to be stressed, and their leaves will begin turning color and will likely exhibit scorching by late summer. Mulch to retain soil moisture and help keep the roots cool. Rare Find Nursery will have a few plants of ‘Ruby Slippers’ available in the fall. I also wanted to mention another nursery I found in the process of looking for sources that is new to me: Hydrangeas Plus. They are working to build up stock of both ‘Munchkin’ and ‘Ruby Slippers’ and will offer it eventually. In the meantime, if you love hydrangeas, check out their other listings!